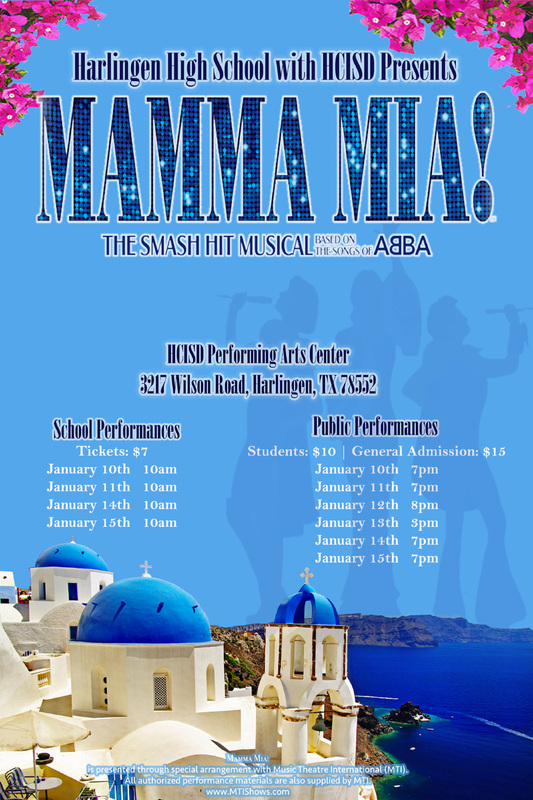 HCISD » HCISD presents Mamma Mia! Harlingen CISD’s Drama Department proudly presents Mamma Mia! the smash hit musical based on the songs of ABBA. Performances will take place at HCISD’s Performing Arts Center located at 3217 Wilson Rd. in Harlingen. Get your tickets online at www.hcisdpa.org/shop/mamma-mia. January 10 at 10 a.m.
January 11 at 10 a.m.
January 14 at 10 a.m.
January 11 at 7 p.m.
January 12 at 8 p.m.
January 13 at 3 p.m.
January 14 at 7 p.m.